Picnic season has arrived! Throughout the cold and rainy winter in Portugal, few people are keen to even venture outside their front door. However, once the weather turns sunny and warm, or more like blazing hot, the Portuguese head straight to greener pastures as wicker baskets overflow with fresh, local ingredients! There are plenty of natural parks across the country to lay out your checkered blanket and feast. Called Parques das Merendas, the Portuguese adore a shady bit of green, especially by the sea, to celebrate a birthday or simply a gorgeous day. In Lisbon alone, it’s an easy excuse to celebrate the championship soccer game held at the national stadium. Located in the large nature park of Jamor, where there’s a huge wooded picnic area above the stadium, football fans hold their version of a “natural” tailgating party just before the big game. 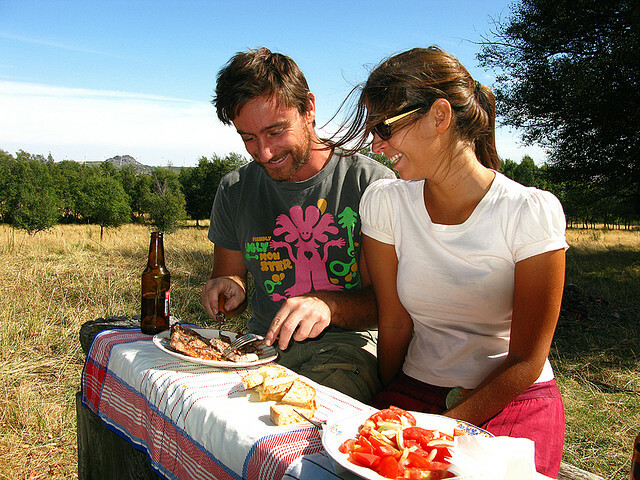 Everyone has their own style of picnicking – especially with kids, and for the Portuguese, it’s unique onto themselves. A traditional Portuguese picnic will typically include: salgadinhos/panados (breaded and fried finger food), rissois de camarão (breaded “hot pockets” usually filled with creamed shrimp), croquetes (minced beef/pork croquettes) and pasteis/bolinhos or pataniscas de bacalhau (salt cod croquettes and fritters). Batatas fritas (potato chips) are also a must, alongside piping hot Portuguese baked bread. Though many parks prohibit grilling during the hottest and driest time of the summer, due to risk of fire, when the Portuguese do enjoy a bbq, you’ll never find hamburgers, hot dogs or steak over the coals! Instead, you’ll encounter various types of cured sausage like chouriço, as well as morcela (blood sausage) and salsichas (fresh sausage), which they’ll warm on some sliced bread with a good hard cheese, like the Azorean Queijo de Ilha (similar to Cheddar). You might also find, entremeada (the cheap cut of fatty meat that’s normally turned into bacon), febras (thin pork cutlets) and frango churrasco, – a marinated whole chicken butterflied open to lay perfectly flat on the grill. When fish comes out of the cooler, the default favorite is sardinhas (sardines). These little pockets of flavor are ideal as they’re in peak season from May – August, not to mention cheap, plentiful and small enough to enjoy individually on bread. When a grill isn’t available, the Portuguese may pick up a steaming grilled chicken from one of the many churrasqueiras dotting the countryside. For those who are from the central coast of Portugal, you may find a whole, spit-roasted baby pig called, Leitão da Bairrada; Lisboners will enjoy a large container of arroz pato (duck rice), and Northerners will choose hearty stewed dishes like arroz de coelho (stewed rabbit with rice) or tripas à moda do Porto (stewed tripe)! Another Portuguese favorite is bola da carne, a savory meat cake, made with a truck load of eggs – they do love their eggs here – divided into whites and yolks. The whites will then make an unsweetened meringue to fold into the batter and filled with a mix of ham, bacon, chouriço, presunto and shredded cooked chicken breast. Not only is it simple to make, the result is rich and tasty! We’ve provided a translated recipe below for you to try on your next picnic. And what does one drink with a king’s feast? Think cold and bubbly! While a cold Portuguese beer on a hot day will do the trick, you’ll inevitably find wine. In the South, they’ll chill their red wine to pair with rich meats, especially a fruit-forward tinto Alentejano; while the North savors a crisp Vinho Verde, or equally cold verde tinto, which is a traditional pairing with grilled sardines. One of my personal Vinho Verde favorites is Casal Garcia’s vinho verde rosé, a fabulous accompaniment with grilled chicken, sausage, cheese and Portuguese fried finger foods. When having the crispy-skinned roast Leitão, I might suggest its traditional pairing of tinto espumante– a dry red sparkling wine from the local Baga grape of the Bairrada region. My favorite brand is Quinta do Ortigão. And with the abundance of seasonal fresh fruit, many locals opt for Sangria with either red, white or sparkling wine- the sparkling one is great mixed with fresh strawberries in season. So on your next piquenique, why not mix it up a bit Portuguese style? And Portuguese, we’d love to hear about more of your favorite picnic foods and wines! Want to grill a traditional marinated Portuguese chicken at your next barbecue? Check out “Portugal’s Frango no Churrasco” for the recipe!